I’m not really a big handbag collector, but when I find one that really is interesting, I might capitulate and add it to the handbag shelf. This one from the early 1960s is a good example. 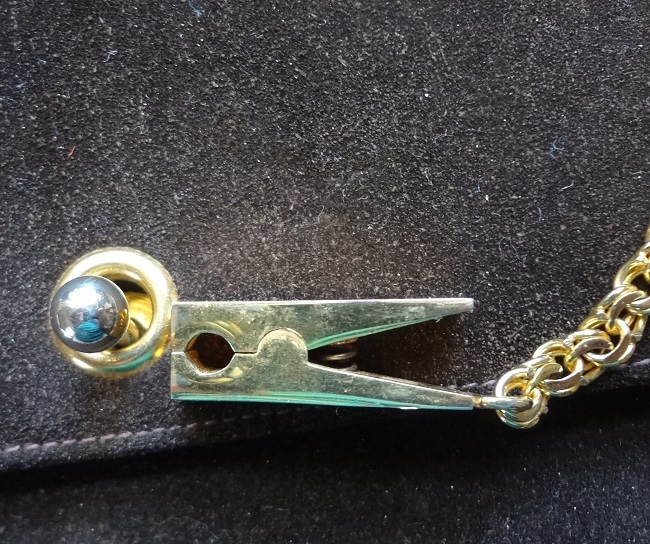 I was hooked by the little golden clothespin clasp. Who could resist? A woman is only so strong in the face of such a novelty. It wasn’t until I got this bag home that I realized it has another interesting feature – it coverts from a handbag to a shoulder bag. 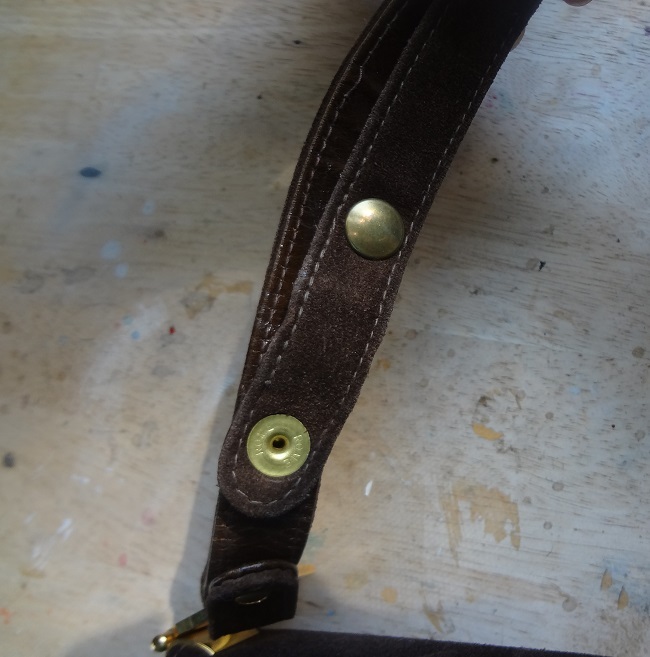 The strap snaps so that it can be lengthened. This got me to asking myself a question. I was sure that the bad was from the early 1960s, but were women wearing shoulder bags during that time as well? I had always associated the longer straps with the late 60s and the 70s. So I went on a search through my vintage magazines, starting about 1958. What I discovered was that shoulder bags were being shown for a short time starting in 1960. 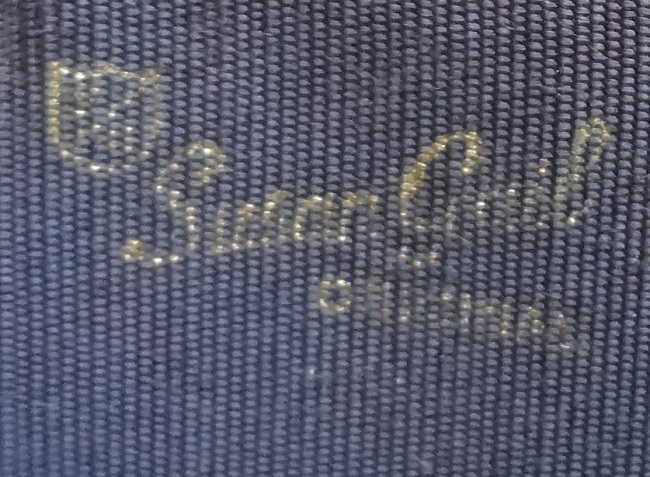 Maybe my bag was an attempt by Susan Gail to test the shoulder bag waters, but with the assurance that if it turned out to be a mere fad, the bag could still be used. I was hoping to find ads for Susan Gail goods, but I failed in that attempt. 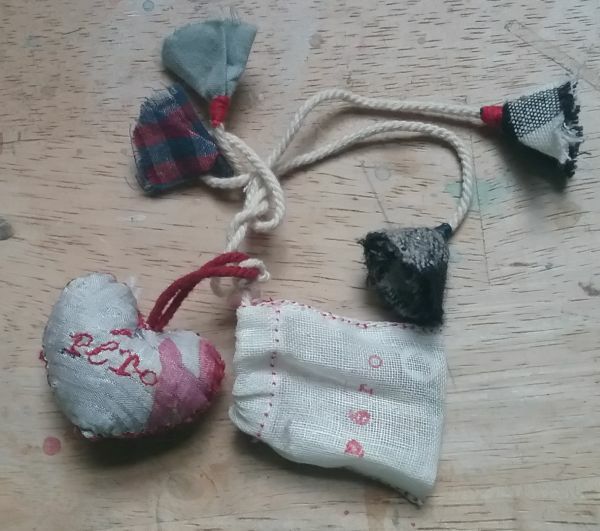 I did find an entry for the company at Bag Lady U. 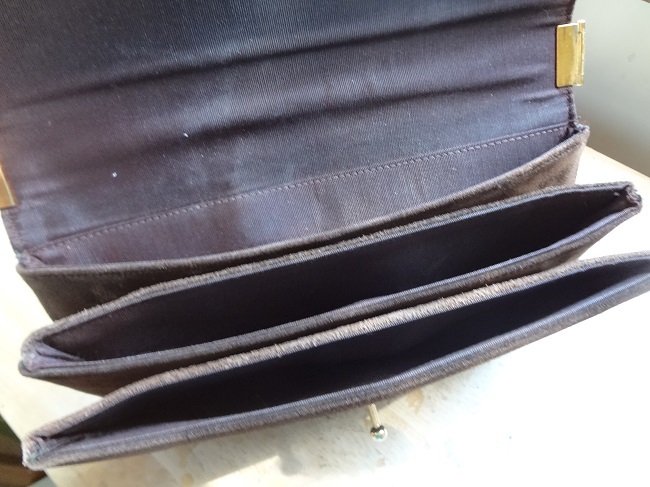 The Susan Gail Accordion bag design results from the unique interior frame design. A series of folds in the gussets are not attached to the metal frame and expand wide when open. As you can see, my bag has this design feature. I went on an internet search of other Susan Gail bags. What I found was that the company did a tricked-out copy of the Gucci bamboo handle bag. They also made bags that look suspiciously like the Hermes Kelly. That’s pretty sad, because my bag is pretty nifty, proving that being creative and original beats being a copycat any day. I can pretty much count on the fingers of one hand the number of times I go shopping at retail. It’s usually when I’m in a bigger city that has the type of high-end stores that you are not going to find in Western North Carolina. In all fairness, I’m usually not shopping for real clothing, but rather, for ideas. It was when I was in Charleston, SC recently that I became aware of Péro. I’d never heard of the brand, but I was so impressed by the beauty of the textiles that I wanted to see more. 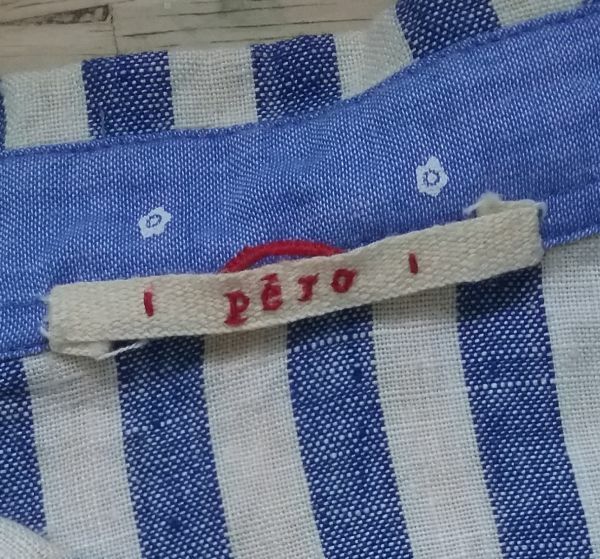 Péro was started in 2009 by Aneeth Arora, and from the beginning, craft has been the driving force of the line. All the fabrics are hand-loomed of natural fibers, and the garments are embroidered and finished by hand. It’s very labor intensive, the very opposite of what you might think garments made in India would be. This type of craft, quality, and skill is not cheap. 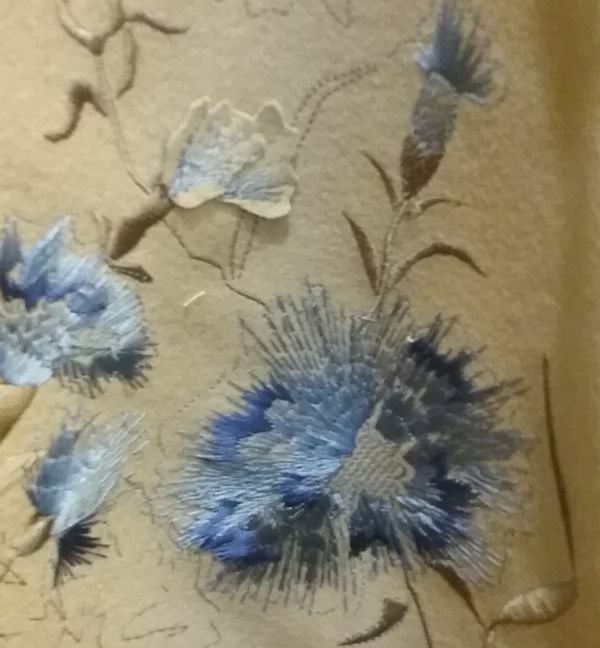 I’m not exaggerating when I say that the beauty of one indigo coat with embroidery made me almost ignore the price tag and cave into my desire to own that object. But cooler heads prevailed, and I left the shop without the coat. But I could not forget about Péro, so when I returned home I began to read all I could find out about the line. Best of all is Péro’s Instagram account, where employees and their stories are regularly featured. They tell where and how materials are sourced, and how they work with artisans across India. In all the reading and looking, I finally found a garment that is really in tune with the types of things I like to wear. Yes, I adore embroidery, but I’m really more of a stripes and solids lover, and the embroidered pieces are more than I wanted to pay. So the top above seemed like a good idea, especially since it was deeply discounted. I knew before I bought it that I’d be altering the sleeves, as that much fabric in the crook of my elbow would drive me crazy. 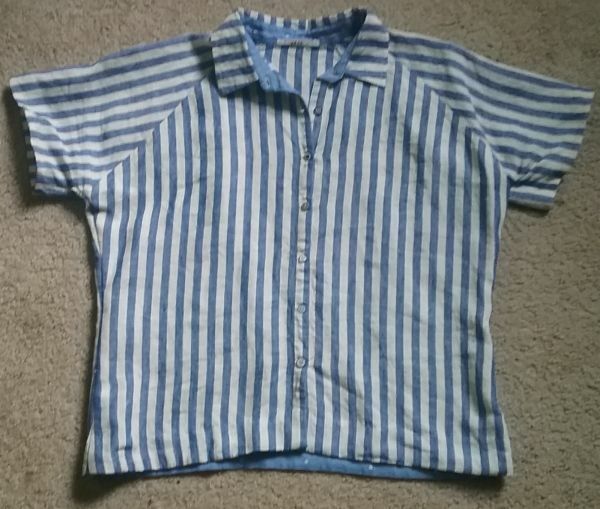 However, when the shirt arrived, I was shocked at just how over-sized it was. If you can’t read my yardstick, it reads 30″ across, for a bodice measurement of 60″! The altering job just got bigger, but I was confident I could made this work. And I did. I apologize for the silly shirt on the floor photo, but I’m recovering from a week-long respiratory infection, and trust me, no photos of me are allowed at present. But I do promise a picture of me wearing this before the summer is over. It’s just too cute not to share. I cut enough from the sides that I actually have enough fabric to make pockets. I’m going to wear it a few times before I decide if I need them. So, now let’s look at what makes Péro so special. 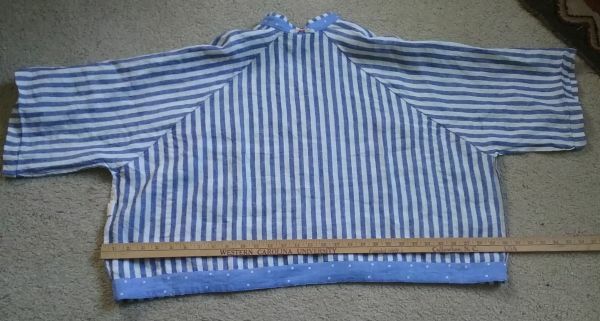 The bottom edge is faced with a cotton fabric, and then the facing is hand hemmed. 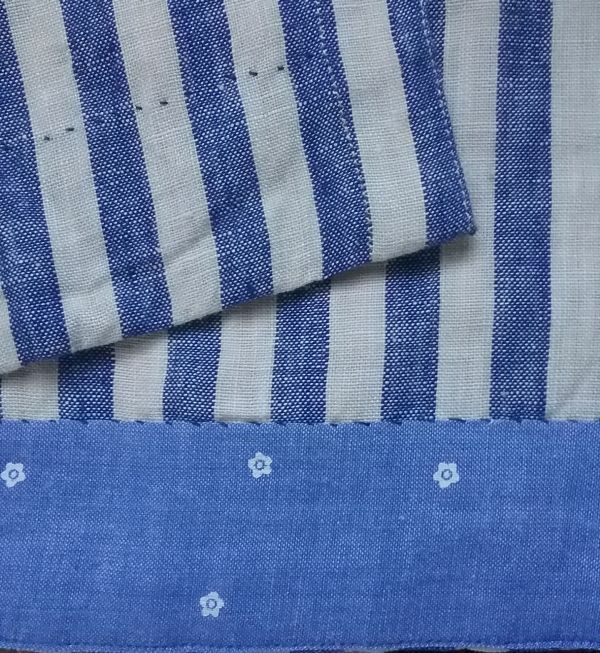 The stripe is linen. The care instructions call for dry clean only, probably due to the mix of fabrics, but I carefully washed this before beginning the alterations and there was no shrinkage in either fabric. 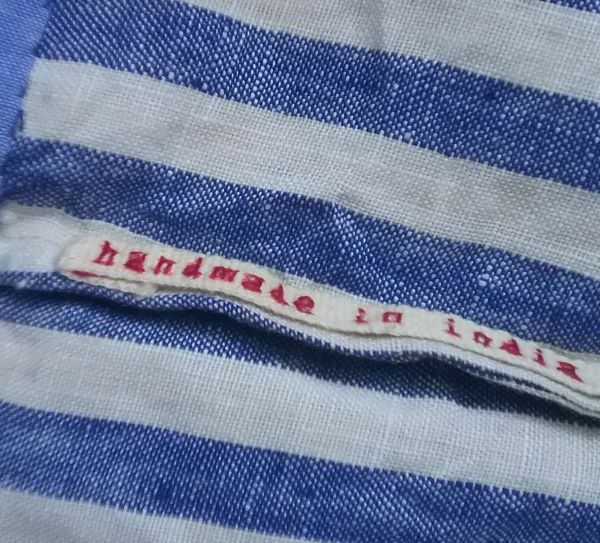 Even the labels are hand embroidered, as is the red hanging loop. The seams are machine stitched, and all seams are flat fell or French seams. Even the buttons are special. They are made by a local ceramic artist, and are hand-molded and hand-painted. Each one is different. 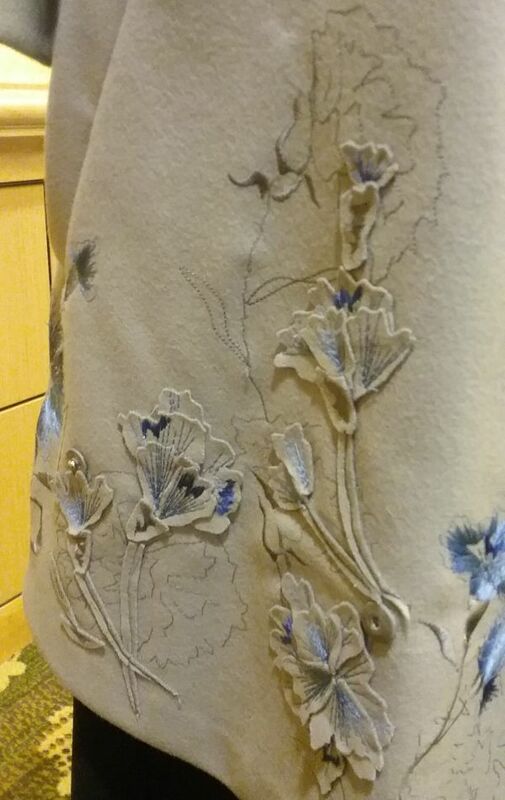 And see if you can tell that even the buttonholes are hand-stitched. We can’t all afford these incredible embroidered confections, but we can appreciate the beauty of them. We can see hope for the garment industry in that there are some brands that are working toward fair treatment of employees, and who promote skillful work. 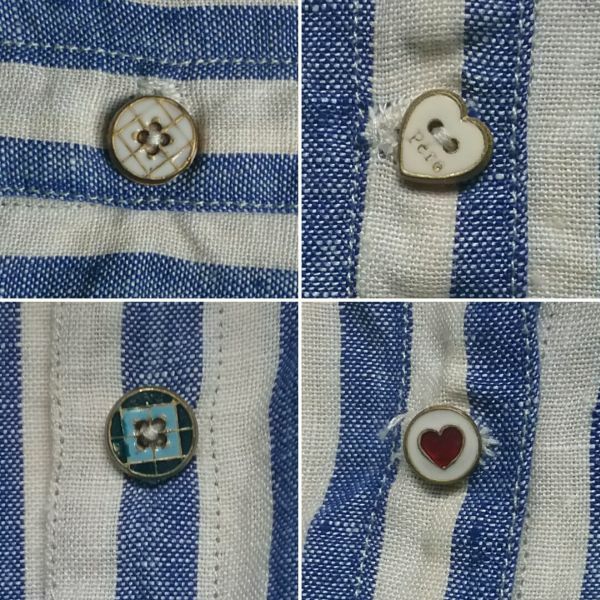 Update: The little heart and flowers in the top photo were attached to the label of the shirt. The pouch holds extra buttons. Is there any evidence that this 1908 photo inspired Paul Poiret to design his hobble skirt? Or is this just one more modern interpretation of the past? I have been reading David McCullough’s The Wright Brothers and in it the story is repeated that Poiret saw the photo and had an inspiration. This is not referenced in the endnotes, however. A photograph of Madame Berg seated on the Flyer at Wilbur Wright’s side, beaming with pleasure in advance of takeoff, made an unprecedented magazine cover, and the famous Paris dress designer Paul Poiret, quick to see the possibilities in the rope around the ankles, produced a hobble skirt that became a fashion sensation. In looking for the answer, I made the obvious series of Google searches, and in doing so found more and more misinformation. 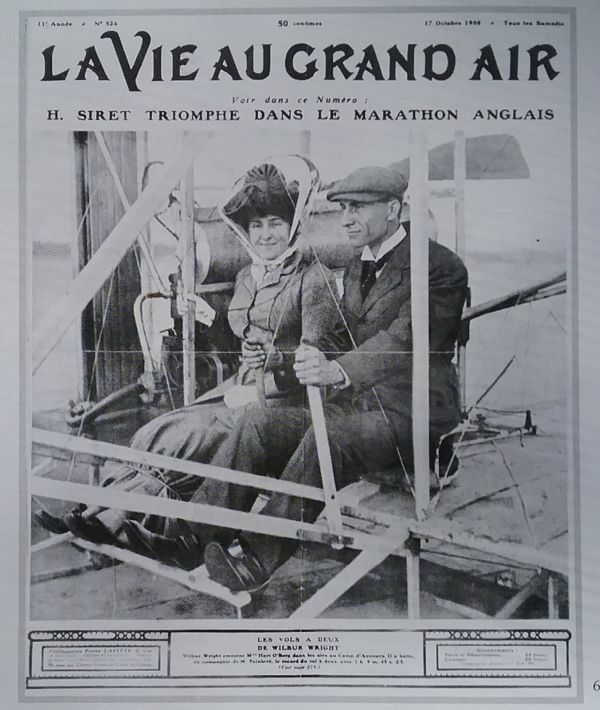 Edith Berg, seen in the photo, and who was the first American woman to ride in an airplane, is sometimes identified as Katherine Wright, the sister of the brothers. In some tellings of the stories, Wilbur tied the robe around Mrs. Berg’s legs, in some she tied the rope, and in others her husband tied it. One site calls Mrs. Berg “Hart Berg”, which was her husband’s name. Others claim she was the first passenger to ride in the Flyer. A French fashion designer watching the flight was impressed with the way Mrs. Berg walked away from the aircraft with her skirt still tied. Mrs. Berg was then credited with inspiring the famous “Hobble Skirt” fashion. To be fair, many of the sites I found tell the story as a “possibility.” But in others it is related as fact. Several even gave the Wright Brothers credit for “inventing” the hobble skirt. The closest thing I’ve found to a contempory source was quoted in Alison Matthews David’s book, Fashion Victims. A New York Times article from June, 1910 called the hobble skirt the aeroplane skirt. This does seem to hint at a connection to the skirt and to the practice of early women passengers having their skirts tied below the knees. I also found a 1928 article based on an interview with Edith Ogilvy Druce, formerly Mrs. Berg. In the article she claimed to have inspired the hobble skirt. I know that Poiret was not one to admit his fashion inspirations, so I doubt that he related this story even if it were true. He did write an autobiography, but I have not read it. If he was inspired by the photo, why did he not make the first of his hobble skirts until two years later, in 1910? I know I’ve presented more questions than I have answers, and I have one more. Is the answer even out there? I promise this is the last post from the CSA symposium I attended recently in Cincinnati. And this is really just for me to formalize my thoughts on the two days spent immersed in talk of fashion and technology. I really like how CSA develops their symposiums around a theme. As a teacher I used to go to conferences on writing or history, and the presentations would be all over the place. With a theme, common threads start to emerge, and one starts to hear multiple opinions on the same topic. It makes for a more thoughtful experience. One thing that so many of the presenters, especially the college professionals who work in design programs, pointed out, is that the great majority of fashion design students have zero sewing skills. I realize that a person does not HAVE to sew in order to create designs (much like Karl Lagerfeld), but it sure does help to know what can and cannot be accomplished with a sewing machine, the basic tool in making a garment. So the starting point in most design programs is a basic sewing class. One teacher made the point that it is the attempted making of a welt pocket that separates the sheep from the goats. He estimated that half of his students do not make it past the welt pocket. Why can’t Suzy and Johnny sew? According to my two new friends from Lipscomb University in Nashville, it is because so few high schools have home economics classes that teach sewing. They were particularly perturbed because Lipscomb Academy, which is closely associated with the university, recently did away with sewing class. (I looked, and my alma mater does teach sewing in two classes called Apparel Development). Another common thread came from the people in charge of collections. The big concern is the need for continued digitalization of collections both big and small. This refers to the placing online of searchable databases of an institution’s clothing collection and archives. While everyone who addressed this issue was pretty much in agreement that digital collections are highly useful for researchers and curators planning exhibitions, there are some major problems that prevent institutions from putting their collections online. The first and the most daunting is that the process is very expensive. You may have read about the financial problems at the Metropolitan Museum of Art. Some critics claim that a big part of the money drain was due to a huge push to digitalize their collections. That may be so, but the result is that the Met is in possession of a database that is widely used, maybe even over-used. Several presenters pointed out that they were tired of seeing the same old Met garments used in scholarly works. Another problem is that digital problems quickly become obsolete. Some institutions that were early users of digital programs are now having to replicate their previous work due to low resolution of photographs and outdated computer systems. These problems aside, if an institution wants their collection to be seen in today’s world, the best way to do it is online. As one presenter pointed out, a digital online presence is no longer a “nice thing”; it’s a near necessity. It boggles my mind to think of all the great collections, and the holdings within. What if there was a universal database of not just the major museums, but of all clothing collections, even private ones. I’m always reading that an example of this or that major milestone in fashion no longer exists, but I’m betting that somewhere, in some avid collector’s closet, one does exist. I know I’m dreaming but part of the joy of being with people who are thinking about and working on solutions to these problems really opens the mind to the possibilities that the digital universe brings to us. Several presenters talked about social media and blogging, and how these platforms have proved useful to fashion researchers and scholars. I’ve actually addressed this topic here, as the interactions I have with all of you greatly enrich my own understanding of fashion history. Having an audience for my writing is important, but so is getting feedback from readers. And the same is true of Instagram, where people are quick to point out something missed and to add to what the photo poster knows about an object. There was also a lot of talk about 3-D printing and other technologies that are being developed. 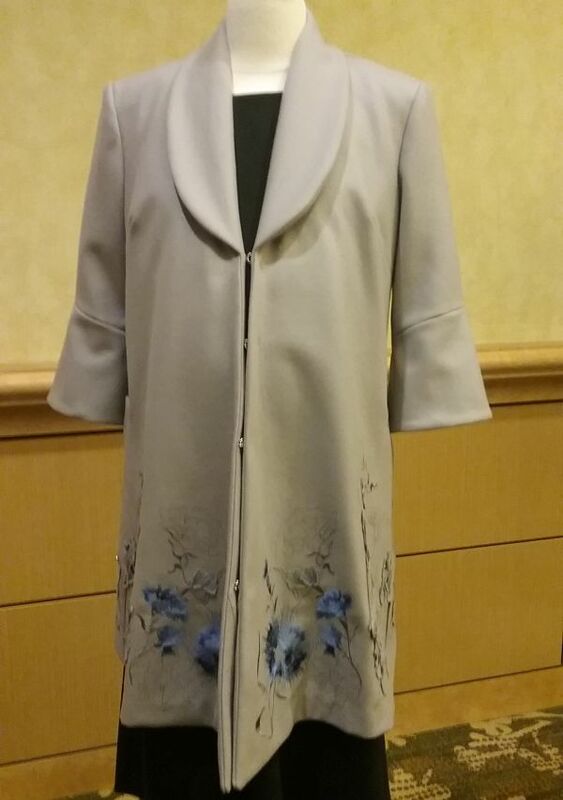 Interesting, but what really caught my attention was this maternity coat, designed by Chanjuan Chen and Kendra Lapolla at Kent State University. The pattern for the coat was developed using a computer program, and the placement of the pattern on the fabric was analyzed by computer which was able to fit the pieces onto the fabric with less than five percent waste. 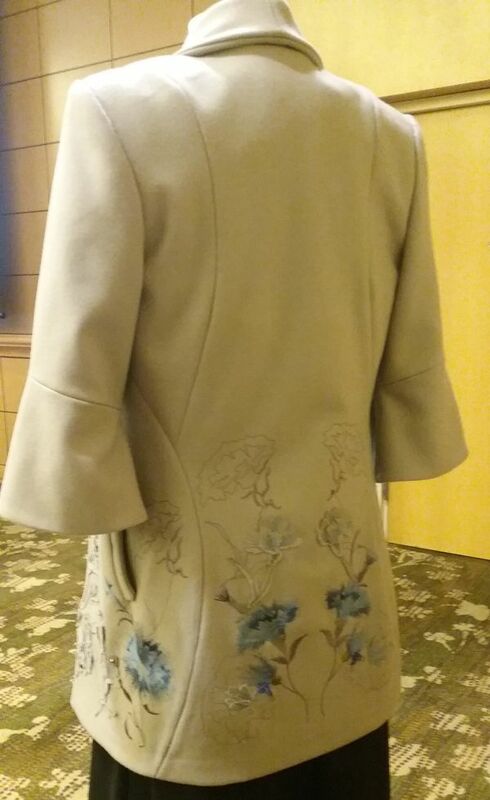 That five percent was then used to make the appliques, so there was essentially no waste in making the coat. The embroidery was also made using a high tech embroidery machine. I really did think it was hand embroidered. So, there you have it. I hope you enjoyed coming along with me to Cincinnati. It’s been sort of a slow two weeks in fashion stories, and I was worried there would not be enough material to do a Vintage Miscellany post. Turns out I was right, so next week will bring the regular post. 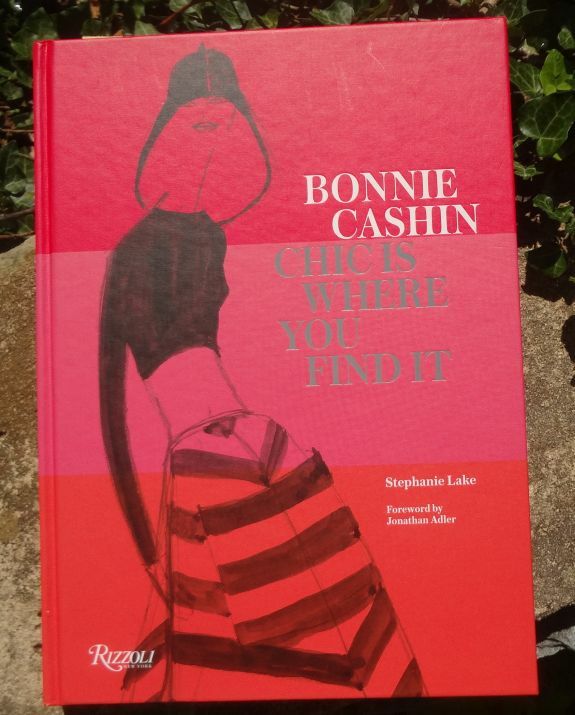 But for this week, I want to focus on two items concerning American designer, Bonnie Cashin. Yes, Bonnie has been in the news, but not in a way that would please her fans. The first item stems from a post on Jonathan Walford’s blog. Raf Simons, who is now working at Calvin Klein, sent an orange cape down the runway that looked familiar to instagrammer @vrazdorskiy, who posted a side-by-side photo of Cashin’s cape and the one on the Calvin Klein runway. 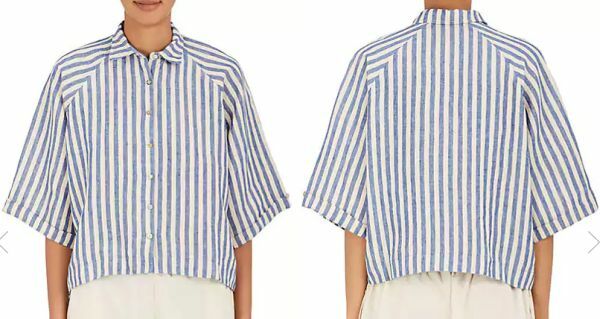 It doesn’t take a fashion expert to see that this is the same design, and if you were to play a “spot the differences” game, my guess is that you’d be stretching it to name three differences, mainly in color. In response, Stephaine Lake, who wrote the book on Cashin and who owns Cashin’s person collection, started a new Instagram account, @cashincopy. We all know how important Cashin’s work was, and how she continues to influence designers. But being inspired and issuing blatant copys are two different matters. The second story is one that Lake posted on Instagram, concerning a bag that Cashin designed for Coach in the early 1970s, called the Rural Free Delivery. In this case, the design was not copied, as it is Coach that is re-releasing the bag. What is interesting is how Coach is handling the history of the company, and how it is being misinterpreted by fashion writers. The story in question is on the Glamour website, and is titled, “Coach Is Rereleasing a Bag From Its Archives.” The writer states that the bag is from Cashin’s first collection with Coach, in 1972. 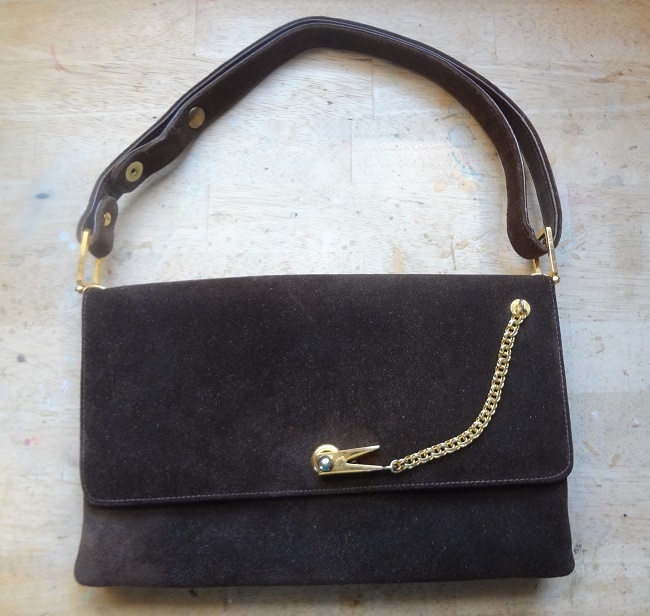 Actually, Cashin first designed for Coach in 1962, which was when the first Coach items arrived on the market. The 1941 date is misleading, as while the company that eventually gave birth to Coach was started in 1941, Coach was a different division within that company. So what’s the big deal about the date when a company was established? Coach itself uses 1941 in the name of their collection. But how long will it be before people selling vintage Coach bags on eBay start dating them to the 1940s and 50s? In a rush to make Coach a “heritage” brand, the real story is diluted, and people are missing out on the authentic, and very interesting story. The term “Cash and Carry” is an old grocery wholesale phrase, and it was extended in WWII to be a policy of the US selling supplies to countries as long as they paid cash and carried off the goods themselves. Bonnie Cashin adopted a pun on the phrase, Cashin-Carry, to describe her line of totes. I’ve never seen the term referred to as “Cashin Carries” as stated in the article. It completely misses the meaning of the pun. And finally, Cashin was not a “creative director” at Coach. The term was not even in use at that time, and according to Lake, Cashin worked on a royalty basis. Her contract was not even with Coach; it was with the parent company, Gail Leather Products, a leather goods wholesaler. And besides, Cashin never “directed” any assistant designers, as she alone designed everything that carried her name. It’s no secret where the writer got the “creative director” phrase, as Coach uses it on a page that introduces the bag. But on the sales page itself, there is not even a mention of Cashin. There is a big deal made about “artist Keith Haring’s iconic illustrations” which are on a hangtag and the cloth lining. I’d love to have the job of “creative director” at Coach. You just dig into the archive, pay royalties to a deceased artist’s estate, and voilà! A brand new bag, or as Glamour put it, “new and improved”. Thanks to Stephanie Lake for answering my question and clarifying the story for me. 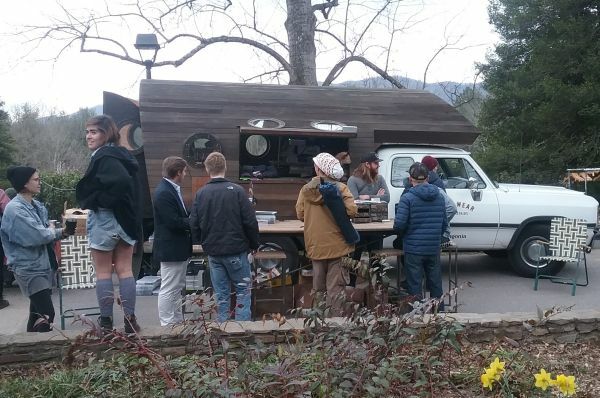 Yesterday the Patagonia Worn Wear rig made a stop at Warren Wilson College, which is located in nearby Swannanoa, NC, and I was able to drop in to see it in action. 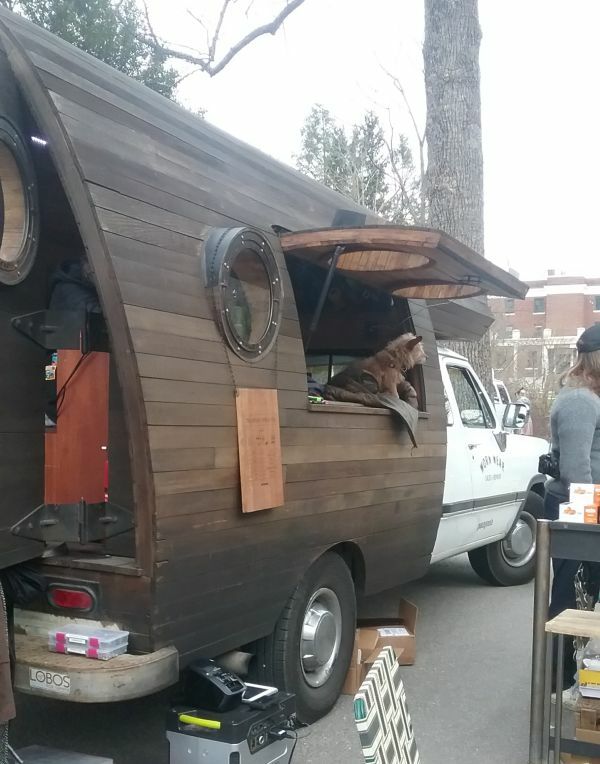 The rig, seen above, is actually a mobile clothing repair shop, which is currently touring the country with stops at selected college campuses. Tiny Warren Wilson was lucky to be chosen, as most of the schools on the tour are large universities. The purpose of the tour is to raise awareness of how clothing repair is an important part of making the production of clothing more sustainable. It seems like an oxymoron for a company like Patagonia, which is in the business of making and selling clothes, to advocate for people keeping their clothing longer. But Patagonia is not the average clothing company. 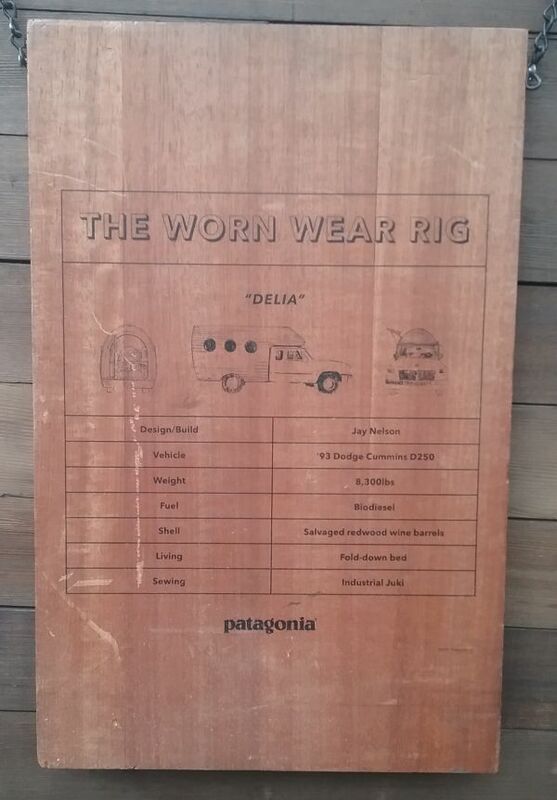 Patagonia is a producer of outdoor clothing and supplies, and is not a “fashion” company. But all clothing reflects to some degree what is in fashion, either through color, or the length of shorts, or the fit of a tee shirt. As a maker of fleece jackets and down jackets, Patagonia does not rely so much on changing styles in order to sell their products. Instead, they sell garments that are actually needed. Even so, they are working toward educating people that need can be reduced through repairs. I’ve written about Patagonia before as an example of a company that makes it easy for the consumer to know where and how its products are made. If you go to their website, on the sales page of each product it shows the factories where the product was made, along with a description of the responsible practices of each. It’s about as transparent as it gets in the clothing industry. The Worn Wear team did on the spot repairs, but even more importantly, they wanted to talk with students (and even non-students like me) about the importance of taking care of one’s clothing to make it last longer. They encouraged visitors to learn the skills necessary to make repairs to damaged clothes to extend their life. And of course, behind the message is the starting point of buying good stuff to start with. The rig itself is really interesting. 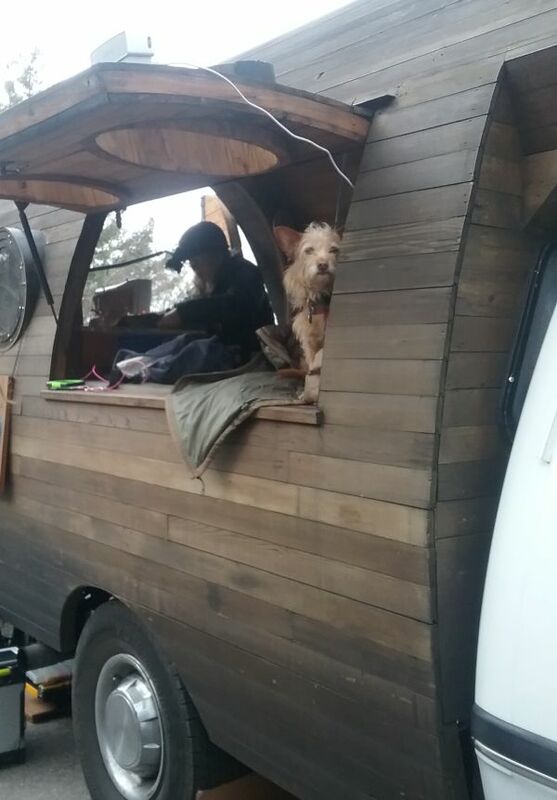 It’s made of completely recycled materials and it runs on biodiesel. 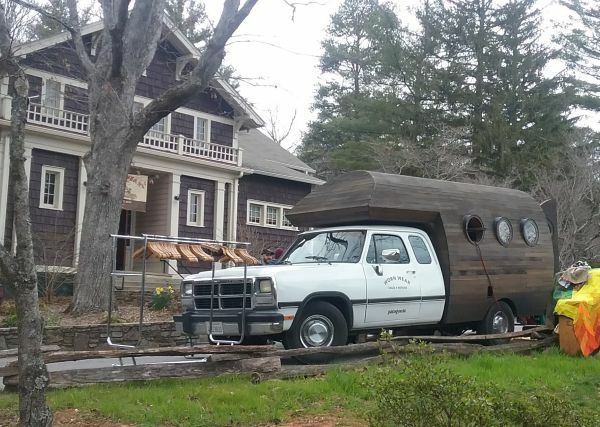 It’s beautifully constructed, and I imagine they get lots of attention on the highway. 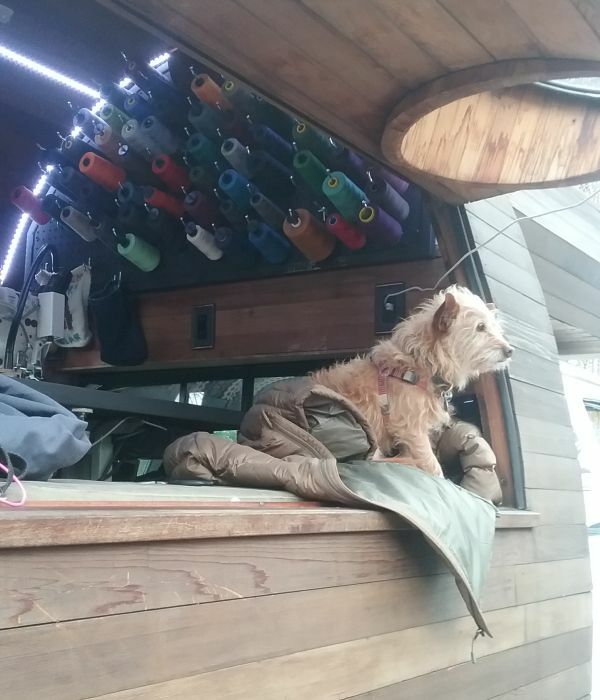 This is Rudy, who guards the thread and keeps the staff on track. There was even free swag. Besides the organic fruit bar and a small guide to making repairs, there was a shelf of free books, all titles pertaining to environmental and human rights issues. 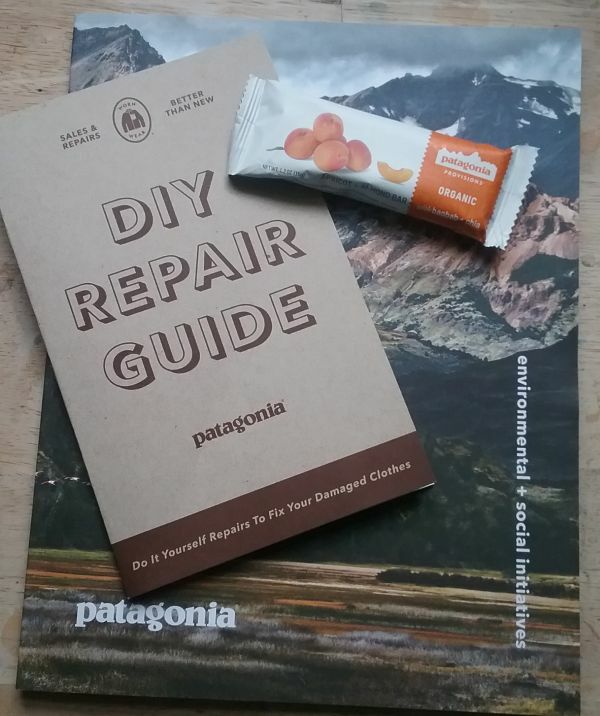 I picked up a copy of Patagonia’s latest report on these initiatives, and spent much of the evening reading about the many things that Patagonia is working toward. 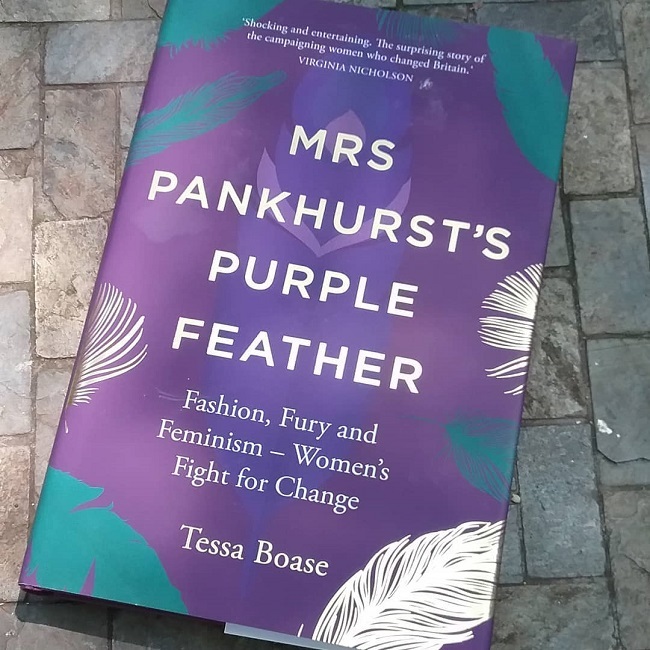 Most interestingly, the book did not back away from the mistakes they have made in the past few years, and gave honest reports on two controversies, the use of down from force-fed geese, and the use of wool from a farm which PETA exposed as being inhumane. In both cases Patagonia did their own investigations, and found they were in the wrong, and then took the necessary steps to correct the abuses. It’s really refreshing when a group just owns its mistakes. I can’t help but think that this would be a great policy for all. Currently, a big issue is the discovery that microfibres that get into the water by way of laundry has become a major source of pollution in our oceans. In order to better understand what effect Patagonia fleeces and other products have on this problem, the company conducted a research project in which all their projects were tested for microfibre shedding. They are also funding continuing research in the area. Cute dog mascots are always a plus! The issue of sustainability is a tricky one. Most of the programs by clothing companies I have read about are just green-washing, meant to look to be more environmentally friendly than they truly are. Most, like turning in old clothes for a store credit, are just ways of getting one to shop more. And as pointed out in an excellent article at Vestoj, even the way sustainability issues are presented by the fashion press usually misses the point. 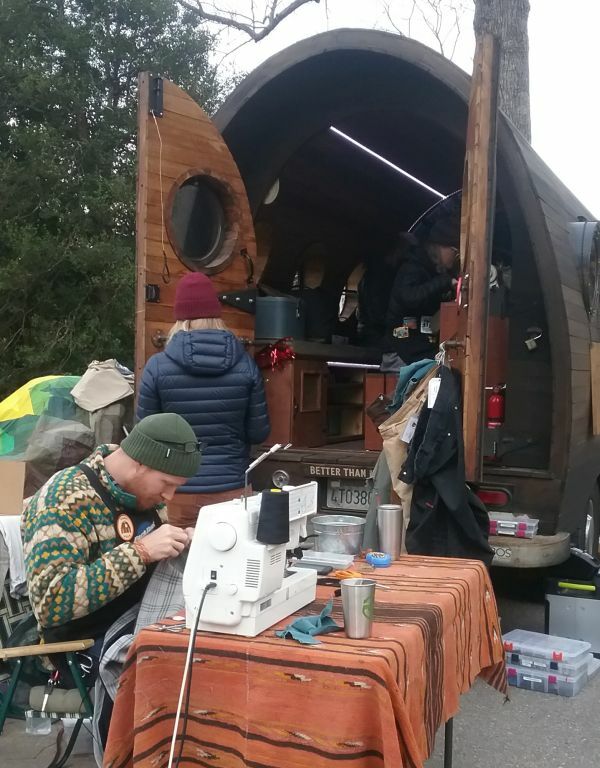 Thanks to Patagonia for hosting this tour of the traveling repair workshop. If it happens to roll into a college near you, go and check it out.